Tina Hardwin, the Club and Events Board representative for NAMI on Campus, looks at beads that represent the loss of a loved one while hosting a table for Welcome Day in the Student Center at American River College on Sept. 13, 2018. On a recent weekday afternoon, students and faculty visited the Student Center at American River College and sat at a table filled with beads meant to represent the loss of different loved ones. 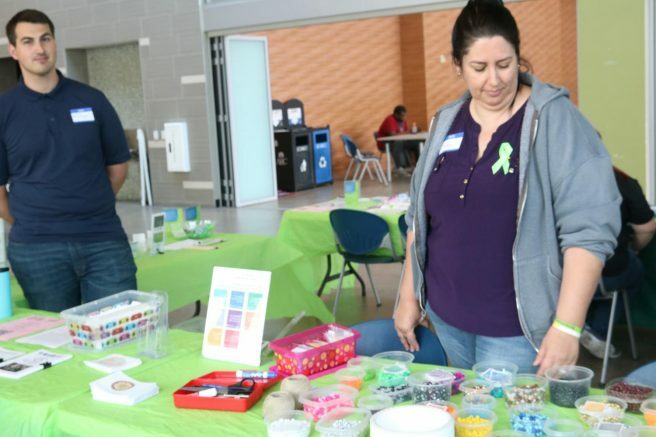 The beads were provided by the National Alliance on Mental Illness (NAMI) Sacramento; the group was there, along with its new chapter, NAMI on Campus American River College, to educate the college community on various mental issues. At the event, which took place during Suicide Awareness Month at ARC’s Welcome Day on Sept. 13, students strung beads quietly as representatives from NAMI, a grassroots mental health organization, provided information on different community resources. NAMI’s mission is to help build better lives for those who are affected by mental health issues in any way. NAMI on Campus ARC is a fraction of the bigger organization, which will lead to more resources for students and access to better help. These are peer-led mental health awareness clubs on college and even high school campuses. The ARC club Life is Worth the Walk is being integrated with NAMI on Campus. The club will be the same and still have its name, it will just fall under NAMI on Campus. Madison Holsinger is the Secretary of NAMI on Campus and believes the changes will have a positive impact. “We are going to still have both [clubs], but we are going to try and have Life is Worth the Walk under NAMI on Campus ARC,” Holsinger said. The club will get a bit of an overhaul, with a brand new logo created by the Design Hub and waiting for approval by NAMI of Sacramento, according to Holsinger. The changes within LWW may make it seem that everything is changing. These changes are going to make it better for students. LWW will still be the same group, but they have NAMI backing them. Suicide awareness and prevention are just some of the things NAMI helps students out with, according to Holsinger. Tina Hardwin, the Club and Events Board representative for NAMI on Campus, said she is excited to implement the new name. “We’re building into exciting things,” Hardwin said. For the time being, Holsinger explained, students will see NAMI on Campus ARC and LWW under the same umbrella, so that new students and students who are involved with LWW will not be confused. The club meeting times are the first Thursday of every month in the Portable/village 609a, from 12 to 1:15 p.m.
Be the first to comment on "Life is Worth the Walk now under NAMI on Campus ARC"